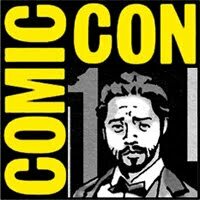 SDCC is like The Island and I'm Jack Shepherd. "WE HAVE TO GO BACK!" After planning on not going to San Diego Comic Con and telling myself over and over that I'm flat broke, unemployed, and that this year just wasn't happening, I am now going to SDCC. My friend is speaking on a panel, and has a 4-Day Guest Pass. His guest backed out at the last minute so he decided to put the screws to me, and demanded I go. The only catch was I can't stay with him due to the fact he's staying at a hostel, and I have no money. I decided I'd only go three days (Thur-Sat) to make the trek financially feasible. My parents were nice enough to pay for my train ticket and share of the hotel room, which a school friend is allowing me to stay in for Thursday and Friday, and now I'm going. Today I updated my portfolio with some recent narrative pages I've drawn, then I printed out some new home-made business cards. I've never had money to actually sit down, design, and send off a nice, official-looking card for mass production, so instead I print them off my computer onto bristol board, then I slice them up with a ruler and an x-acto knife. 3 cheers for ghetto bizniz cards. All energy flows according to the whims of the great magnet. What a fool I was to defy it.